The full thing will launch in a month. Remember StarCraft Universe? 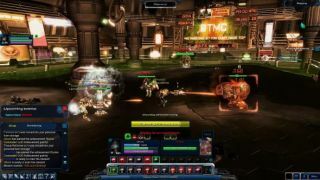 The ambitious, fan-made multiplayer StarCraft mod pricked up the ears of Blizzard's lawyers several years ago—probably because of it was initially called World of StarCraft—before heading to Kickstarter, with Blizzard's blessing, and under a new name. Upheaval, the team behind the free-to-play online RPG mod, raised almost $90,000 around three years ago, and now it's done. It's done! Well, nearly. It'll be done in a month, but StarCraft Universe is in open beta now. You'll need either StarCraft II or its free Starter Edition to play, and if you have those, just load up Battle.net, search, and it should be there.